DIARY OF A CONSERVATIVE PARTY AGENT: Nothing to wine about! Our incredibly cantankerous neighbour, who Cllr Paperclips and I refer to as "Victor Meldrew" due to his permanently miserable face and hostile demeanor, has just knocked on our office door. "Yes?" I said, suspiciously, expecting another of his long moans about the 1001 things we do to irritate him. He actually once sent me a rude note complaining that I had parked my car overlapping into the neighbouring parking bay by 2 cm (he had measured it) despite the fact the bay I had strayed into was also one of ours. Apparently I was "setting an overlapping precedent which, if not addressed, might cause similar issues with other tenants." Anyway, rather than moan, he said "I have something for you, it's wine" and handed over what was clearly a box of wine. I was somewhat taken aback, this is the guy who when I once wished him "good morning" in the lift he actually replied "it was until you interrupted my concentration." I was a bit lost for words and started thanking him profusely for his kindness. In fact, I think I was a bit over profuse as I wanted to ensure he knew I appreciated his gesture and perhaps build a new, friendlier relationship next year. He stood listening to me, smiling and nodding, before saying - right, must go. I hope you enjoy it. And off he went back to his office. I returned to me desk and then the horror dawned on me. On the box was a DHL courier label. The wine wasn't from him. It has been sent to us as a gift and one of his staff had taken delivery as Jon and I were out. He clearly knew I had misunderstood and was listening to me thanking him knowing the truth, and probably enjoying the situation. I now feel like banging on his door and withdrawing my gratitude and pleasantries ,but I wouldn't wish to give him the satisfaction! 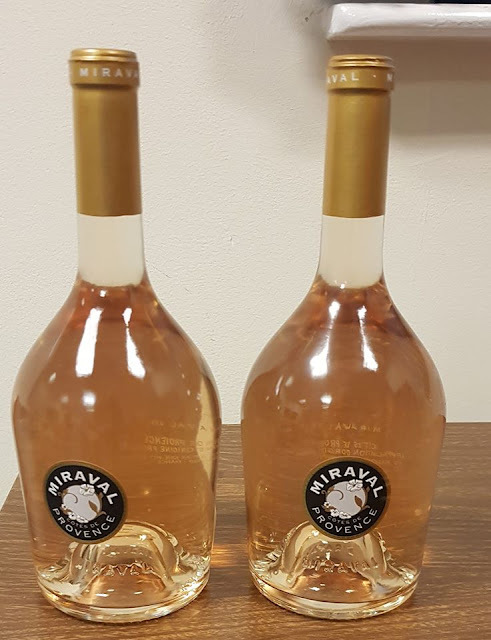 Anyway - I am now the proud owner of two bottles of wonderful Chateau Miraval Rose, but absolutely no idea who they are from, as there is no delivery note or card in the box. If you are the sender THANK YOU but please text or email to to let me know, as I would like to send a note of thanks and also drink to your health and happiness when we open them over the Christmas holiday.